Created by renowned master weaver Ethel Halvar Andersson, this exquisite Scandinavian rug features a compartmental pattern decorated with lovely variegated details. 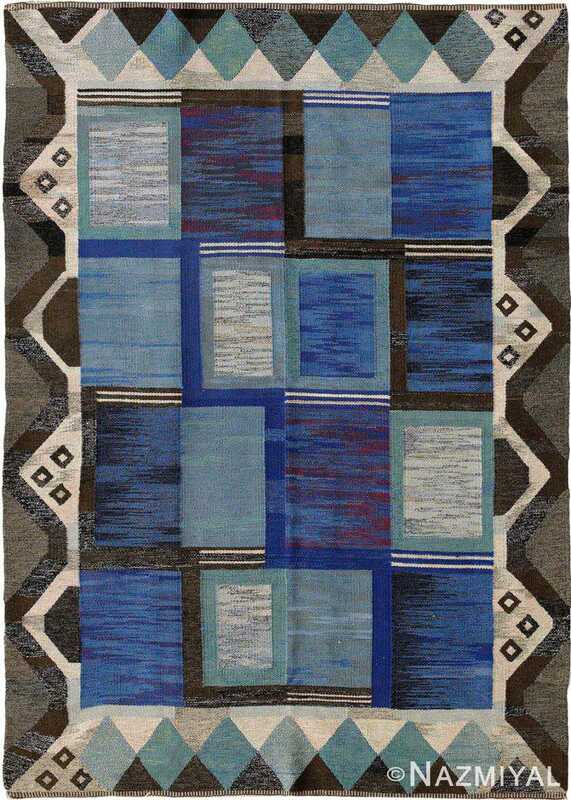 Vintage Swedish Kilim, Origin: Sweden, Circa: Mid 20th Century – This distinguished vintage Swedish Kilim rug created by the legendary weaving artist Ethel Halvar Andersson features a simple compartmental design executed in a vivid selection of gradated blues ranging from muted glaucous to cobalt and deep midnight blue embellished with flecks of magenta. Subtle bursts of color and variegated streaks with the movement of brush strokes incorporate a complex selection of complementary hues. Trailing borders fame the edges of each compartmental module cascading across the richly colored field. Geometric borders decorated with angular zigzag motifs, voided lozenges and achromatic white and charcoal black details offset the saturated sapphire blues and subtly shaded turquoise lozenges and argyle diamonds that enclose the composition. This sophisticated Scandinavian carpet showcases strong geometric designs and abstract patterns rendered in a superb selection of cool blues paired with soft grays and charcoal black.